Like so many other things in life, there are several ways to get things done. The same goes for towing. If you’re unfortunate enough to need to have your car towed, you should be aware that you have several alternatives for accomplishing that task. Without doubt, one of the best and most elegant towing techniques is flatbed towing. What’s Flatbed Towing You Ask? Imagine how royals of old got around – hoisted on a cushioned platform and elegantly carried wherever they needed to go. That’s pretty much what flatbed towing is. As one of our flatbed trucks will hoist your car off the ground and onto its back you’ll simply know that your vehicle is in good hands. What’s So Great about Flatbed Towing? Well, first of all it’s much safer. Your vehicle won’t even touch the ground during the ride so you won’t have to worry about pit holes or lesser road conditions damaging your car. It will also be tightly harnessed to our flatbed truck so you won’t have to worry about that, either. Furthermore, it’s a much more flexible means of towing. Some vehicles can’t be towed in the regular way. Whether we’re talking about especially low cars or motorcycles, flatbed towing is a much more preferable towing solution. When it comes to your car you’ll want only the best to take care of it. Shield Towing and a network of independent tow truck operators provide professional towing & roadside assistance services in the Walnut Creek area. Our team is consisted of trained, experienced, and certified technicians, who will know exactly how to take excellent care of your car. 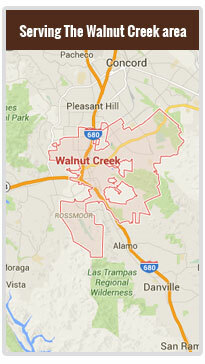 Since we’re local, we can respond to any call, any time, in Walnut Creek and its vicinity rapidly – that means you’ll have to spend less time idly waiting by your car and that you’ll be able to get on with your day much more quickly. Other than that, with Shield Towing you’re guaranteed to benefit from 24/7 availability and a fair pricing policy that will both protect your interests and provide you with the best customer experience you can hope for.